While working on a studio project at Karma Productions with Bassist Richard Park, John Harvey met Gene Russell and John Dzubiak. We worked together after the studio project was mastered to form a new band that would support the release. As a brand new band in need of a name, Mr. Russell offered his long time childhood nick name..... And Slyther was born! We are excited about the debut release, which features Special Guest Guitarist Cory Smoot, of G.W.A.R. and Mensrea, and Gibby Gibson of Mensrea, who contributed his talent on drums for the studio project. Native American chants by Mark Lichtenfield. Please take some time and listen to the songs and leave feedback on what you think. We would love to hear from you! 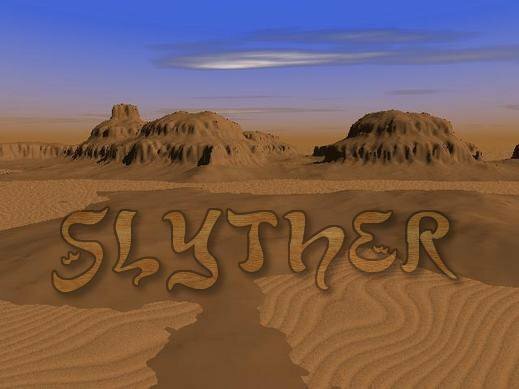 Become a fan to keep up with the latest news from Slyther! Our first release is a culmination of just a few of the many songs John Harvey has written and perfected over many years. The studio project was a giant step towards getting this entire idea off the ground. Finding each person to support this work from our initial release has been a challenge. But with anything you love with all your heart, it is worth the sacrifice to keep working towards the end goal. Sharing our passion for the music we create with our fans! We are writing new material and plan to be back in the studio very soon! Our second release will feature our current line up of John Harvey on Vocals and Rhythm Guitar, Gene Russell on Bass. John Dzubiak on Lead Guitar, and with our most recent addition of Robin Ritter on Drums. Slyther is getting airplay with our latest release, For The Life Of Me. The first release has been played on Studio B with Jay Smack on XL102 in Richmond, VA, and on both Localmotive and Aftermath programs on WNRN in Charlottesville, VA.
Our history is short, but together we are creating a sound that is unique and raw. In your face riffs and hooks, along with melodies and leads that will stimulate any imagination. Our passion for music is first and foremost. We have diverse influences and inspirations, which helps give our music a blend of Rock and Blues, with the Alternative edge that puts us in a category all our own. You have to experience a live show to truly capture the essence of our band. Slyther is actively involved with charity events and we support the Susan G. Komen Foundation, and McGuire V.A. Medical center in Richmond, VA. Slyther performs every month at the V.A. hospital for charity events that are held for their patients. We love being involved with such foundations and organizations because we firmly believe in giving back to our community and to the causes that we support as individuals and as a band. We are ready to support other local bands, as well as headline to support our latest self-titled release. More shows will be posted soon. We look forward to seeing you at our next show! Glenn G - Artist of the Day ! Eyes Like 20 - Band of the Day ! Dai Sharkey - Artist of the Day ! Yankee Rhoad - Band of the Day ! Absolute-Blackness - Band of the Day !! Promotion Band and Artists List !! Cathy Hill - Artist of the Day !! Band & Music Promoter - CHRISSY SINN ! !